Simply Nerdy Mom: Should You Consider Couples Therapy Before Tying the Knot? Should You Consider Couples Therapy Before Tying the Knot? Marriage is a huge commitment, which is why it's safe to not jump into it head first without discussing some major topics to find out if you are truly compatible or not. Believe it or not, I've known couples who rushed into marriage and found out after being wed, that they really didn't share the same views on a lot of things, from children to join bank accounts. There are a number of things you may want to consider about your wants and needs in a relationship that a therapist can really help you work out between you and your significant other. You'll want to make a list of things that are important to you. This list serves as kind of a 10 year plan, so to speak. Take the time to sit down and make individual 10 year plans. Share those plans with one another. At this point, you can see what is important to your significant other as comparable to what is important to you going into your future together. If time lines don't particularly match up, that's perfectly okay! The purpose of this activity is to mainly see what each of you would like to see happen in your future. This becomes a stepping stone to the next part, which is asking each other questions. It may seem boring and business like to conduct an interview with your partner, but how else will you know where you both stand on certain things that married couples face daily? 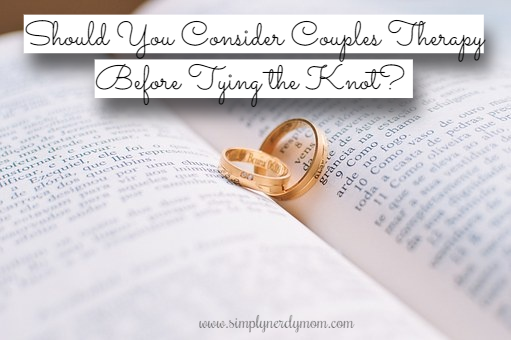 Asking the obvious, like how many children you would like (if any), how soon to have them or how far apart to have them is pretty common and I'm sure couples have talked about these prior to getting engaged. However you may also consider bringing up household chores, religious and spiritual beliefs, financial goals and budgets as well as financial responsibilities, joint or separate bank accounts, and who may be responsible for the bills. Some couples choose to split the bills, some choose to alternate who pays, and others choose to pay certain ones while their spouse takes care of the others. Discussing where and when to purchase a home is a huge decision as well, and you want to make sure you can be on the same page. Another topic that's important is relocation for work and career. Believe it or not, when my husband and I got married, we never even considered this. Then the time came where his employer asked him to relocate from Pennsylvania to Texas. He was okay with moving, but I wanted to stay to be close to my family. It was a difficult decision, but we ultimately did decide to stay and instead of relocating, he just travels a lot when they need him to. Truth be told, even the traveling can put a strain on an otherwise happy, healthy relationship. So this is something I would urge you to be prepared for as a couple even if you don't think it will ever come up. Some more obvious things to consider prior to going into marriage is holidays: who to spend time with during major holidays and what holiday do your religions celebrate. If you discover that many of these things just aren't lining up for the two of you, there's no shame in trying couples therapy. Couples therapy isn't just for married couples who are on the verge of divorce. It's a great way to discuss these things you already laid on the table with a neutral mediator that is trained to help you work through everything and come to a reasonable agreement that will strengthen and bond your relationship. For more information on couples therapy and the cost of counseling, you can read more, HERE. Good wishes to you, and may your love prosper!